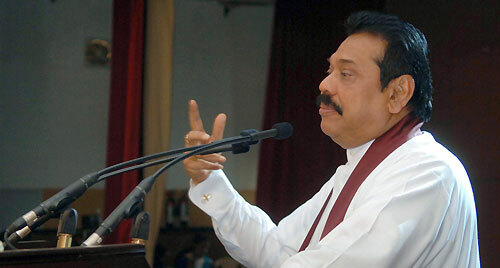 President Mahinda Rajapaksa emphatically stated that the era in which Sri Lanka sought outside loans to feed its people would soon be over. The President was of the opinion that the country would soon achieve self-sufficiency in its agricultural needs with the Government giving pride of place to this sector. Commenting on the many incentives given to improve agriculture, the President said that while a farmer had to spend only Rs 1,435 on fertilizer to cultivate an acre of land the Government spent Rs 27,500 to supplement the effort as a result of the prevailing subsidy on fertilizer. The President made these observations addressing a political rally in Kekirawa held in support of UPFA candidates contesting the Anuradhapura district. The President noted that the Government was looking at developing rural economy with strategies based on location specific needs, modernising agriculture, strengthening supply chain and marketing etc. Also massive irrigation schemes in progress would provide farmers with year around water to support their agricultural productions, he added. The President also noted that instead of spending monies on imports the Government would divert them to foster and encourage local agriculture. In addition to improving agriculture various other programs are in the offing to improve the living standards of the people in the area. Already the notion border villages which prevailed in the area due to acts of terrorism have been wiped out and people are enjoying their new found freedom. Now it is time to focus on development and we all have to work as one to achieve our objectives in this regard, he added. He told the gathering that in the near future every household in the district would be provided with electricity. The Government allocated Rs.7200 million for this purpose from the last budget, he added. In addition we would also enact a separate program to upgrade the road network in the area. The efforts undertaken in this regard so far has paid rich dividends and has lessened travel time considerably, he observed. The President told the gathering that a convincing parliament majority at the April 8 polls would help to accelerate the ongoing development process. However, you should appoint people who could work and fulfill your expectations. Your number one priority is to ensure victory for the betel leaf. If you do this then we can increase the number of UPFA nominees in Parliament. Then you have three preferences and you can use them according to your choice. However don’t forget to send representatives, who could propagate your wishes, he added. During the occasion a team of lawyers who had been active UNP members for a long time joined the UPFA. This included UNP lawyer’s association head in the area J. M. Koswatte. Ministers Maithripala Sirisena, D. M. Jayaratne, Artiste Jackson Anthony and all UPFA members contesting the district too addressed the gathering.